The herbs are abundant and fragrant this time of year. While the flowers are modest, the shape, texture, and colors of the leaves bring interest to the garden. This month's project, an index card accordion herbal, focuses on the leaves. The book is currently decorating a side table in the dining room and also can be used to identify herbs in the garden for novice gatherers. To make the book, you can follow these directions for an Index Card Accordion Book. For this book, I glued index cards to both sides. On the front are leaf prints. I placed a leaf face down on a stamp pad, then placed a piece of scrap paper over it and rubbed. After folding the scrap paper in half to avoid getting ink anywhere else, I gently placed the leaf face down on the card, covered it with scrap paper, and rubbed. On the back side I wrote the names in Latin and some plant information. I'm a big fan of Latin names and find that I learn best by writing things out. You can see the complete book on flickr. Check out the Resource Center for a video about nature printing (good information but the images are small and don't work well at full screen) and written information. There's also a member's gallery, news of the annual workshop, and a printing guide book that looks great to purchase, THE ART OF PRINTING FROM NATURE: A Guidebook. A pdf on Nature Printing with Children from Cornell Plantations. You can find another style of herbal book in this previous blog post. In celebration of herbs, here's some lavender items—a small vial of lavender essential oil from Lavender Wind Farm on Whidbey Island, a lavender candle, and a little lavender weaving I made— and a small book to create your own herbal. Leave a comment and you'll be entered into a random drawing. The drawing will close on Thursday at midnight. I love your blog. Love your books. Always an inspiration. I learn so much from your creative sharings Susan! Your blogs, emails, projects, always lift my spirits! Thanks so much for all your sharings! This looks great! And a wonderful way to use some ATCs I wanted to make a book from. Thanks! Ooo, lavender is the best scent! Simply and naturally beautiful! Isn't that always the best combination? Love your post! I love the way you reuse materials. What a great way to keep memory of the lovely flowers/herbs in the garden, although I wish my lavendar looked a little healthier. I might have to transplant! Always enjoy your projects and have incorporated your ideas into our library programs for children and tweens! Love the herb book idea. Since seeing the lavendar fields on the Olympian Peninsula in the Northwest, lavendar has been my favorite scent. Oooooohhh, heavenly, relaxing, wonderful lavender. Just what I need to help me relax and make a book. I love all your projects. Thanks for the inspiration. Thanks for this wonderful blog! Your work is beautiful and very inspiring. 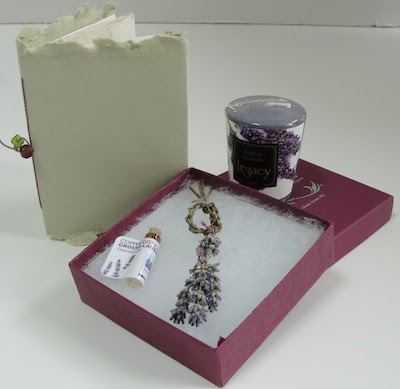 I love receiving your email - you always have such wonderful projects and lavender is my favorite scent of all time. thanks you are very gifted. I love your blog and my students have really enjoyed making books. Last year we made accordion books and twig books. The herb book looks great! I can't wait to try it with my fifth graders! Thanks for the inspiration! Thanks for all the inspiration - always great ideas to be found on your blog. And lovely lavender has got to be my favourite herb - so many uses, and it smells great too! Thanks for your inspiration. I use your ideas with my Montessori class. You website/blog really inspire me. I share the information with childcare providers and parents, so they can share with their kids. Thank you for the herb book idea and the other resources about printing from nature. I always loved your work, so beautiful and full of creativity! This certainly has been the perfect Wisconsin summer to encourage the green growing things of all sorts. After such a busy summer, a little aromatherapeutic R&R is most certainly welcomed ~ and what better scent than lavender to help us take life down a notch and open us up to some well-deserved "me" time? I love lavender and it's applications, but oh! I would love to see your weaving project as well. So glad you share these projects that are so doable. Look forward to your continued blogging. Lavender has long been my fav. I have been cultivating it in the garden. As a teacher, I am always looking for ways to expand books in artful and inspirational ways--ways in which my students will leave my lesson with a lasting memory and hopefully, a new skill! Thank you for your ideas and beautiful work. I think you have just given me an idea for one of my first-day-back-at-school projects! Thank you. So glad to have "found you" and I have been using your ideas with children in an art context. I love lavender and miss the Northwest where we grew it in our yard! Susan, your re-use of materials is inspiring; however, it occurs to me that you must be very organized in your keeping of them. I have a problem throwing things out when I'm in a creative mood, but then i think I might feature in a 'Hoarders" episode! How to you organize your stuff? Can we see some pix? Please. I can't wait to start making books with my students. Printing from herb leaves was part of a workshop I took on bookmaking at Pendle Hill Quaker Study Center about 15 years ago. It had just come to mind again last week when I had reconnection with our teacher, Jill Powers. But I had forgotten about the herb leaf prints. They are so lovely and what a great idea, a manual for begining herb harvesters. Lavender is the BEST scent in the world. Hi Susan, I love your book ideas and have used many of them with high school students. I was prompted to write in response to your wonderful article in the Letter Arts Review that arrived in yesterday's mail. Thank you! I am an art teacher and love your book arts lessons. I just got your book and I love it! Your dedication to your craft and to the environment are inspiring! Mahalo for sharing your creativity and inspiration. Lavendar is cultivated on the steep slopes of Haleakala on the island of Maui - imagine living downslope! I love your work! I am traveling to Sydney, Australia over the next few weeks to teach some workshops, and I just might make this project for the children there! Thank you for so many beautiful and inspirational book making ideas! So lovely! Thank you for your generous spirit and ongoing inspiration. I can't wait to try to make some of your books. I think my kids will love them. This is my first time reading your blog, but it seems to be very inspiring. Working with 5th graders will be a good way to use some of your great ideas. Thanks! I learned about you while taking a course in Philadelphia and have used many of your ideas with my third graders. I just wanted to thank you for helping me be a bit more creative and your directions so I can pass it on to others. Thanks for being a place to come that reminds me to slow down and re-connect my kids to things that I love. Lavender is good for everything! I love it on my pillow and in my ice cream. I love the concept of a herb book and will have to try this one for sure. Thank you! Susan, I am going to make this wonderful herb book today! What a wonderful gift for my Herbal friends in St.Louis. Thanks for all the wonderful comments. I'm glad to know there are so many other lavender lovers. I had my first experience with Northwest lavender last year when we were on Whidbey Island for a wedding and visited Lavender Wind Farm. Loved the blackberry lavender ice cream bar! And walking the lavender labyrinth. Here I'm content with my small garden clump. And Hawaiian Librarian—maybe some day I'll get to see lavender in the Aloha State. Jan D—I do post a photo of some part of my studio once a week on Studio Sunday. There have been a few about organizing but I'll try to do more. During all my years of going to schools and working with 300-400 kids a day, I was forced to come up with systems for dealing with materials. However it doesn't take much to get out of hand. Even if there is a place for everything, I find it so hard to take the time to put things back where they belong. Laurie—Have fun making books in Sydney. And all—thanks for sharing bookmaking in schools, libraries, with families. It's great to hear about it. Please feel free to be in touch(susan at susangaylord.com). If you make a book, send me a photo (or more). I'd love to share them. If a picture is worth a thousand words then your books are worth a million, because you combine both pictures and words to tell a large story in a small space. Thank you for teaching me to do the same. Your little book just brought some peace into my hectic day. I suddenly feel my blood pressure going down. I am sad you are fazing out your blog as I love it and find it easier to follow than a web site. Love lavender too.Lovely give away. Not fazing out the blog at all. It's my monthly newsletter that is going away. Part of the reason is to have more time and energy for the blog. Keep coming back! Susan thanks so much for this blog. I look forward to every post. I will try out this book on my children's group at Yiddish language camp next week! There is an organic farm at the camp center. I wonder if one could somehow scent each card with the oils of the appropriate herb? I will try it and let you know.